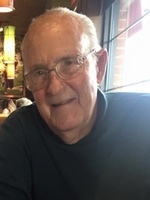 Obituary for Roy G. Harris | Wheeler Mortuary of Portales, Inc.
Funeral services for Roy G. Harris, 85, of Portales, will be at 10:00 AM, Wednesday, March 27, 2019, at University Baptist Church with Rev. Steve Smith officiating. Burial will follow in the Portales Cemetery with Kyle Harris, Jeff Harris, Mark Walker, Nathan Walker, Chad Walker, Chance Walker, Chaney Hancock and Kent McMillan serving as pallbearers. All other friends and Family will serve as honorary pallbearers. The family will receive guests at the funeral home on Tuesday evening from 6 to 7 PM. Those desiring to make memorial contributions may send them to the New Mexico Baptist Children's Home, P O Box 629, Portales, NM 88130. Roy Glen Harris was born May 14, 1933 in Roby, Texas to the home of Bessie Violet (Dunn) and Marcus Bedford Harris and died March 23, 2019 in Portales, NM. Roy graduated from Portales High School in 1951 and received his Bachelor's Degree from Eastern New Mexico University. On Sept. 5, 1953, in Fort Leonard Wood, MO he was married to the love of his life, Geraldine "Gerry" Fay Harris. Roy served in the United States Army and after moving several times due to his military stations, they moved to Portales. For a short time, they moved to Fayetteville, Arkansas to manage a small motel that family members had bought. Later they moved to Tripoli, Libya where he worked for Oasis Oil Company. They returned to Portales in 1970 where Roy worked as a parts manager at various automotive dealers. Roy was raised a Christian, and for the past several years had been attending University Baptist Church with his children. Roy loved to work outside in his garden as well as hunting and fishing. He was an avid reader especially Westerns. He had a soft heart for dogs and was a very faithful Dallas Cowboys fan. He is survived by a son Steve Harris and wife Sandra of Portales; two daughters, Dawn Elyce Walker and husband Mark of Portales and Lori D'Anne Hancock of Portales; eight grandchildren, Kyle Harris and wife Amanda, Jeff Harris and wife Ashley, Stormi Hancock, Chaney Hancock, Nathan Walker and wife Sandra, Chad Walker, Chance Walker and wife Chamee and Stephanie McMillan and husband Kent; six great-grandchildren, and two brothers, Bobby Joe Harris and wife Judy of Chandler, AZ and Bedford Waylon Harris of Surprise, AZ. He was preceded in death by his wife of 65 years Gerry Harris; his parents and a brother Walter Wayne Harris.